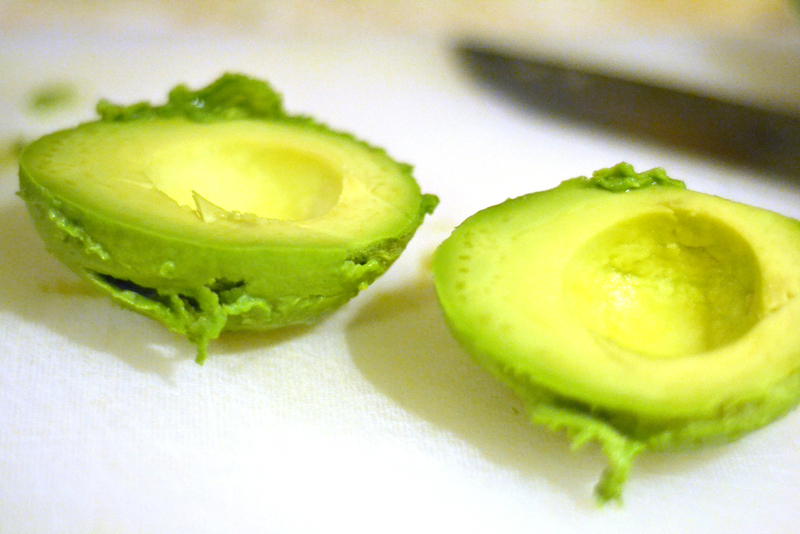 Growing up in California, I always took avocados for granted. They were cheap, in good shape, and everyone knew how to use one. When I moved to Kentucky, I was surprised to find out how expensive they are and to find out how many people outside of the West don't know what to do with them. My in-laws in Wisconsin think that they look and feel gross. Fine with me...that just leaves more for my tummy! I love to use avocados in salads and in guacamole...what do you use them for? 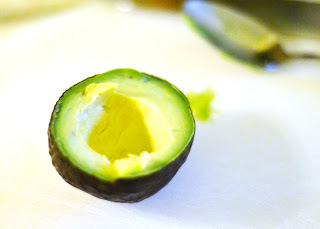 Today I'm going to show you how to get the lovely green flesh out of an avocado in tact and ready to chop or puree. 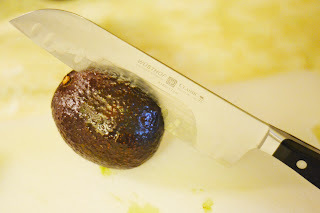 First you need to slide a large sharp knife all around the circumference of the avocado, slicing deeply until your knife hits the pit. Once you've done this, take one half in each hand, and twist in opposite directions. 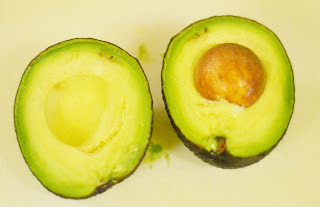 The avocado should split neatly in half, leaving the pit in one half. Take the pit side in one hand and whack the pit with your knife carefully, but with enough force to get your knife lodged in the pit. While holding the avocado half with one hand and the stuck knife with the other, gently twist in opposite directions. 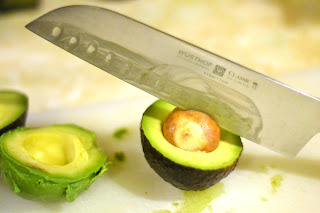 The pit should pop out of the avocado and stay stuck to your knife. Gently remove the pit from your knife. To remove the flesh without squishing it, hold the avocado with one hand, and run a large spoon along the edge of the inside of the skin. The avocado half should come out in tact. 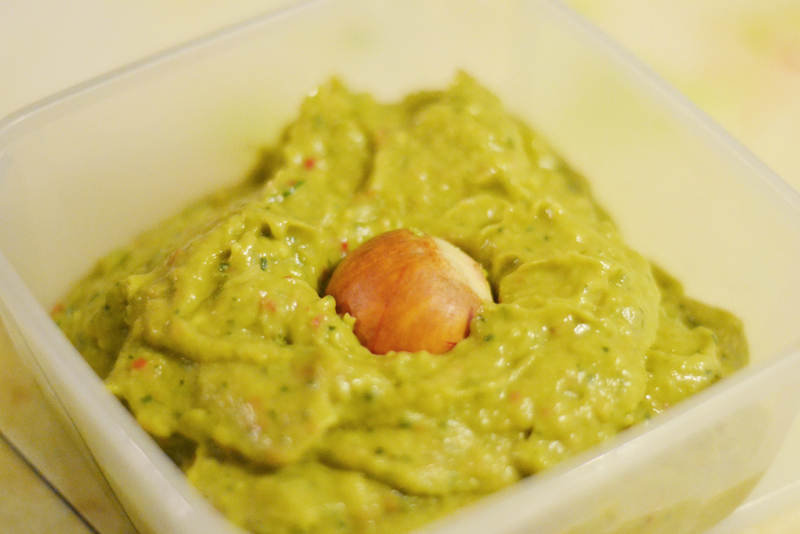 And now you're left with lovely avocado halves that can be stuffed, chopped or pureed into guacamole! Great tip on the avacado pit. I had no idea. Thanks for sharing. I love using avocados on sandwiches :) Much better/healthier than mayo or cheese and as equally delicious! My mom always used the pit in the dip trick when I was a kid! Love avocados, I might be able to live on them alone! Thank you for the sharing. I don't use much of avocados for cooking as its really pricey for us over here but will certainly keep in mind your sharing if the need arises. This is the best advice I've gotten all week. I have a Florida avocado on the counter that's nearly too ripe now. Thanks for the step-by-step pictures that will be helpful when I buy my next avocado. I envy the Californians their abundant avocados. Such a great tip and I love food tips. Thanks so much. Have a great week, too. Since I was a kid, back in France, we ate them in 2 different ways. 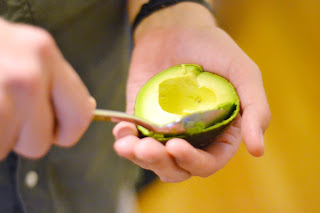 The first one was in salads, the other, which is still my favorite, is to cut the avocado in half, remove the pit, then put your favorite vinaigrette in the pit hole, et voila, go for it with a small spoon. I like to use balsamic vinegar in the vinaigrette, it complement the avocado taste extremely well. Such a useful article! I like reading such articles when i have a free time. Fortunately, i have a lot of free time as best essay writing service online provides me with effective and quality papers within several days saving TONS of time.